The very best way to know if you truly want and can use a product is to see a sample first. We have samples available for all of our books, products and classes available for download on their corresponding product pages. However, if you would like a first-class tour of our website with tips on how to use our products as well as some extra free resouces, such as 1. Globalmania, 2. What Really Happened..., and 3. the HUGE Map Trek Sampler Pack, sign up for our newsletter to the right. We will not share your contact information with anyone and you can unsubscribe at any time. However, if you would truly rather not sign up for our informative newsletter, just send an email to us at helpdesk@kqpublishing.net and request a free CD-ROM that includes all of our free resources. Be sure that you include your mailing address with your request. 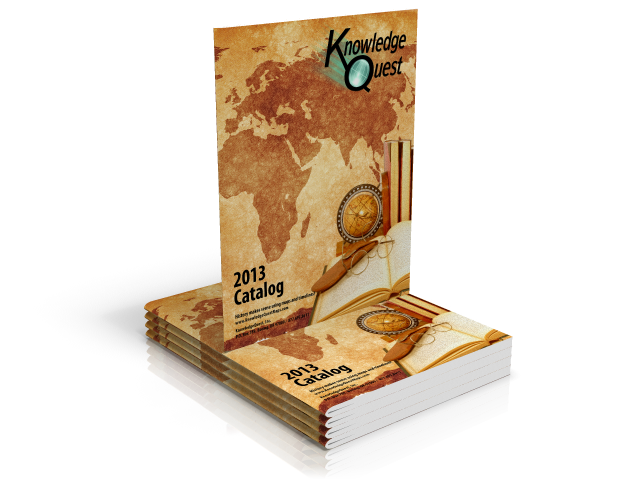 We do not have a printed catalog at this time, and will probably not have one available until early 2014. In the meantime you can browse our digital catalog above or download it to your computer. Just click here or the image above. If you have signed up for our newsletter above, you will certainly be among the first to hear when the next printed version is available.